Washington, D.C. – American Rivers today named the Gila River #1 on the list of America’s Most Endangered Rivers® of 2019, citing the grave threat that climate change and a proposed diversion project pose to New Mexico’s last free-flowing river. American Rivers and its partners called on Governor Michelle Lujan Grisham to permanently stop the diversion project and advance more cost-effective, innovative water supply solutions. Scientists estimate that due to climate change, the Gila River will cease to be a snowpack-fed river by mid-century. The proposed diversion project would put greater strain on Gila River flows already altered and reduced by the impacts of climate change. In turn, climate change likely will limit the amount and availability of water that can be developed by the proposed diversion, calling into question the project’s long-term viability. American Rivers and its partners called on Governor Lujan Grisham to stop the diversion project and instead spend $66 million available through Arizona Water Settlement Act (AWSA) funding on alternative water supply solutions to meet the water needs of communities throughout southwest New Mexico. These solutions include infrastructure improvements and expansions such as the Grant County Regional Water Supply Project and municipal and agricultural conservation and efficiency projects. “It’s time to stop the waste of millions in federal funds on a Gila River diversion to benefit a small number of irrigators and the world’s largest copper mining company, and instead direct AWSA monies to critically important community water projects that achieve long-term water security for thousands in southwest New Mexico,” stated Allyson Siwik, Executive Director of the Gila Conservation Coalition. Flowing out of the nation’s first Wilderness Area, the Gila River supports outstanding examples of Southwest riparian forest, cold-water fisheries and a remarkable abundance of wildlife. The river is home to indigenous people who have lived in southwestern New Mexico for thousands of years, and remains vital to the region’s culture and heritage. “A stronghold for many endangered species, the Gila is one of the last intact rivers left in North America. We have to work hard to make sure it stays that way. 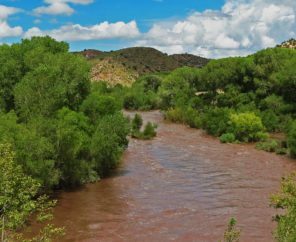 We urge Governor Lujan Grisham to help us protect the Gila River forever,” said Todd Schulke, co-founder and Senior Staff with the Center for Biological Diversity. The annual America’s Most Endangered Rivers® report is a list of rivers at a crossroads, where key decisions in the coming months will determine the rivers’ fates. Over the years, the report has helped spur many successes including the removal of outdated dams, the protection of rivers with Wild and Scenic designations, and the prevention of harmful development and pollution. The Gila River was previously included on this list in 1995, 1996, 2008, 2014. Other rivers in the region listed as most endangered in recent years include the Lower Rio Grande (2018), Lower Colorado River (2017) and Colorado River in the Grand Canyon (2015). Gov. Grisham must choose a healthier, more cost-effective way to provide water to agriculture than by drying up the state’s last major free-flowing river. The U.S. Army Corps of Engineers must consider effective, nature-based alternatives to storm-surge barriers that would choke off this biologically rich tidal estuary. State and federal agencies must enforce laws that prohibit illegal levees, which increase flood risk for communities and degrade vital fish and wildlife habitat. Local leaders must produce a flood protection plan that safeguards communities and restores habitat for chinook salmon — fish that are essential to the diet of Puget Sound’s endangered orca whales. The U.S. Army Corps of Engineers must immediately improve 13 dams to save wild chinook salmon and steelhead from going extinct. The Japanese investment firm, DOWA, must do the responsible thing and back out of a mining project that could decimate native salmon. The U.S. Forest Service must safeguard endangered fish by denying a mining proposal that could pollute this tributary of the Wild and Scenic Salmon River. Gov. Hutchinson must demand closure of an industrial hog-farming facility that pollutes groundwater and threatens endangered species. Local leaders must use state-of-the-art science to craft a responsible development plan that protects this pristine stream. The International Joint Commission of the United States and Canada must protect the river’s clean water, fish and wildlife, and indigenous communities by stopping harmful, polluting mines. American Rivers celebrates the progress Cleveland has made in cleaning up the Cuyahoga River, fifty years since the river’s famous fire that sparked the nation’s environmental movement. American Rivers believes every community in our country should have clean water and a healthy river. Since 1973, we have been protecting wild rivers, restoring damaged rivers and conserving clean water for people and nature. With headquarters in Washington, D.C., and offices across the country, we are the most effective river conservation organization in the United States, delivering solutions that will last for generations to come. Connect with us at AmericanRivers.org.